A quarter of a century ago I lived in Tottenham. Last year (Oct. 2008) I came across this comment on a discussion thread on the Guardian's Comment is Free site. Meanwhile does anybody really think that society is any more broken today than it was on, say, this very day in 1985 when were 58 policemen hospitalised and one hacked to death during the Broadwater Farm riot? The next day the local MP memorably went on TV and said "the police got a bloody good hiding." So I took a trip down memory lane to write a response setting out a very different perspective. Interesting that you don't mention the death of Cynthia Jarrett, the person killed on this very day. Cynthia's house was subjected to a police search (her son was in custody - he had been a passenger in a car which had a dodgy tax disc) during which she was pushed over and died from a heart attack. It was anger at her death which resulted in the events of the following day (6th) the so called Broadwater Farm riots. The local MP was Norman Atkinson. 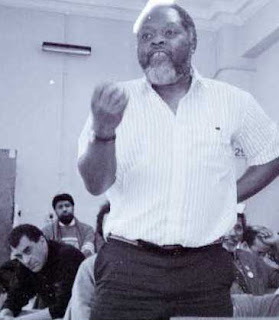 The Council Leader was Bernie Grant. From the day of Cynthia's death (5th)Bernie was in Tottenham attempting both to help the angry local community articulate its feelings and demands for justice and to try and avoid a repeat of the violence and destruction of Brixton the week before following the killing of Cherry Groce. Bernie believed passionately in finding legitimate resolutions and whilst determined to hold the police to account for their racism and violent assaults on members of the community Bernie was determined to avoid a riot. On the Sunday there was a meeting on Broadwater Farm Estate in which Bernie (and others) spoke along those lines. 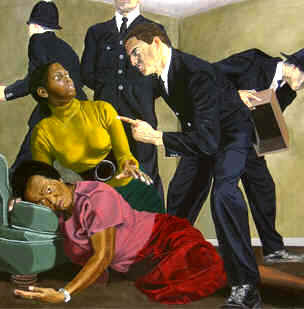 At the end of the meeting it was agreed to go to Tottenham Police Station and demonstrate against Cynthia's killing. The Police however had surrounded the Farm and stopped most of the protesters leaving. Whilst a few of us (predominately white) got to the Police Station most of those at the meeting (predominately young and black) were blockaded on the Farm. Inevitably the stand off didn't last long with hotheads (on one or both sides) igniting the riot/uprising that followed. Over the next few days Bernie took a conscious decision to remain imbedded in the community. He could have retired to the TV studio and poured flames on the situation by condemning and refusing to understand. But instead he was on the scene, listened to local voices and ensured that the community's perspective was articulated. It was a remarkably brave decision for an ambitious politician. Those of us who advised caution he slapped down. This was not a time to think about future elections but to focus on avoiding a further outbreak of rioting and to ensure legitimate grievances were heard. Speaking outside Tottenham Police Station Bernie refered to local reactions, he said that some local people felt the police had been given a good hiding. That was true and Bernie was determined that all points of view should be articulated and that silencing the views of anyone, but particularly young angry men, was the road to further riots. The comment was picked up by the media and Peter Jay challenged Bernie about it on TV and he made clear that although this was not his view it was a legitimate one. Whilst the gaze of the rest of the world moved on Bernie continued to work with the residents of Broadwater Farm and the surrounding area to repair the damage. He understood, cared and was prepared to take risks for what is right. Broadwater Farm and indeed Tottenham were better places for Bernie's leadership. The riots were not repeated, but that was not news. The people of Tottenham the following year went to the Ballot Box and Labour won and Bernie was returned as Leader of the Council. The next year (1987) Bernie stood as the Labour Party's candidate for Tottenham and was elected an MP. His quote was therefore not the mad rantings they were portrayed as but the calculated decision of a civic leader determined to ensure that all legitimate voices were heard and to work for peace even if it damaged his political career. Bernie fully expected to lose the leadership of the Council and to be removed as prospective parliamentary candidate. However he refused to allow this to stop him doing what he felt right. It was a brave decision which history has proved was right. How many politicians make a decision 10% as brave in their whole lives? Bernie sadly died in 2000 at the age of 56. He was a pleasure to work with as an activist and local person. I am not sure all the Council officers agreed. His office was always open and when people came in with a complaint he would summon the relevant officers and councillors to explain the situation. It was a breath of fresh air. When I became a Councillor I often had my surgeries in the next room to Bernie's at Tottenham Town Hall. The waiting area was always packed, not only with people from Tottenham but from across London and often from further afield. If I was lucky one or two were waiting to see me. Bernie has remarkable credibility. People who had never had enough faith in the system to engage with MPs or other elected people believed Bernie would listen and act. But most of all they believed he was on their side. One week Bernie was ill and asked me to cover. I announced the situation and over a hundred people got up and departed leaving me alone to reflect on his remarkable capacity to reach people who the political system had normally offered nothing.